Editor’s Note: Ten years ago, 22 leading voices on the topic of prediction markets—a group that included several recipients of the Nobel Memorial Prize in Economics—wrote an influential Science article entitled “The Promise of Prediction Markets.” In a three-part series, SportsHandle looks at whether prediction markets for sports are promising too. This first installment of the series takes a pilot study approach with a look at a cash-based prediction market focused on the pending Supreme Court sports betting case. If you think you know the outcome of the pending Supreme Court sports betting case, you can now put your money where your mouth is. PredictIt—a real-money “prediction market” located just blocks from the Supreme Court building—is offering residents of all 50 states the chance to forecast the result of the most important sports gambling lawsuit ever. At the same time the Supreme Court is considering in Christie v NCAA whether nationwide legalized sports betting could become a reality, traders can stake up to $850 on whether the lawsuit brought by the NCAA, NBA, NHL, NFL, and Major League Baseball against New Jersey will end with the federal sports wagering ban contained in the Professional and Amateur Sports Protection Act (PASPA) being lifted. 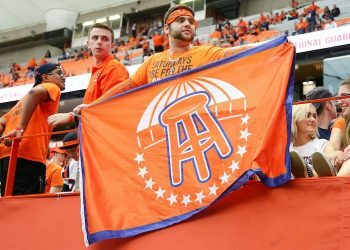 And after more than two months of market activity, PredictIt traders are bullish on the prospect of New Jersey—and perhaps dozens of other states—having the ability to authorize legal sports betting in a post-PASPA world. “Prediction markets are forums for trading contracts that yield payments based on the outcome of uncertain events,” wrote almost two dozen thought leaders a decade ago in an oft-cited Science academic article. Prediction markets have long been a part of decision-making in government and private business. But PredictIt is available to the masses, with a user-friendly interface recognizable to anyone who has ever bought or sold a publicly-traded stock via an online account. “Our focus is on political forecasts,” said Will Jennings, Communications Director at PredictIt in Washington, DC. “The more informed that voters are, the better. Since being launched in 2014, PredictIt customers have run the gamut. Some are high-volume power users. Others are more recreational. The hot-button topics of the day can drive market activity. 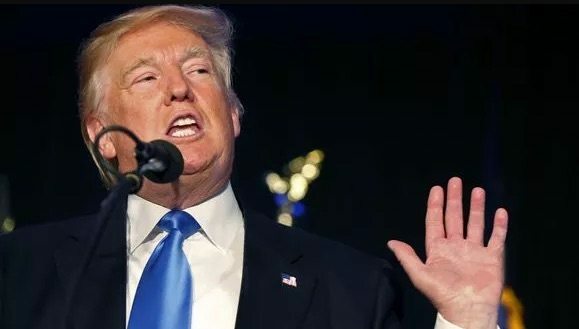 Indeed, the current political environment has been a boon, with several markets tied to various events taking place during the first year of the Trump administration. 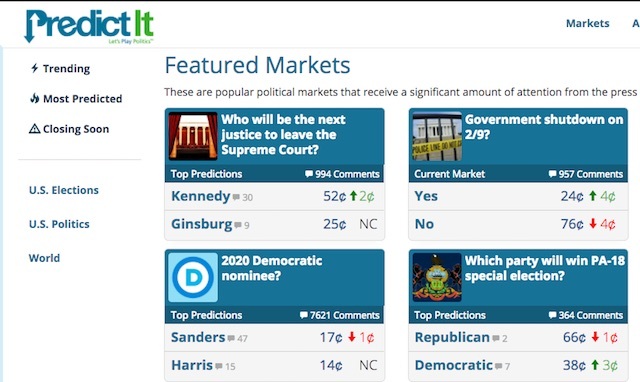 Most PredictIt markets—including the one for the Supreme Court sports betting case—are framed as binary questions with mutually exclusive “Yes” or “No” answers. All trades are tethered to a $1 “contract” between customers, with probabilities pegged at 1% (a penny), 99% (99 cents), or somewhere in between. For example, Trader A thinks an event has at least a 60% chance of taking place so she offers 60 cents for a “Yes” share. PredictIt matches her offer with that of Trader B, who is willing to pay 40 cents for a “No” share. Each trader now owns a share in the market for this event on opposite sides. The prices of shares will change over time and both traders could decide to sell their shares at any time. If an event does take place, all “Yes” shares are redeemed at $1. Shares in “No” become worthless. 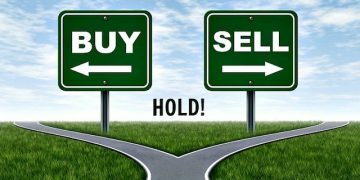 If the event does not take place before the market closes, traders holding shares in “No” will be paid $1, while “Yes” shares will be worthless. In other words, there has to be a counter-party to any offer, much like a stock exchange. PredictIt does not take a position in any market, but does charge a 10% fee if traders sell a share for a higher price than initially paid or if the contract is redeemed for $1. Traders are limited to $850 in total contracts in any single market, with each market capped at 5,000 traders overall. That is how the binary question posed in the PredictIt market is presented. The market opened on November 30. An answer of “Yes” would mean that PASPA is declared unconstitutional by the Supreme Court and New Jersey would prevail. To answer “No” would be to uphold PASPA and deliver a Supreme Court win to the five sports leagues who initiated the lawsuit. 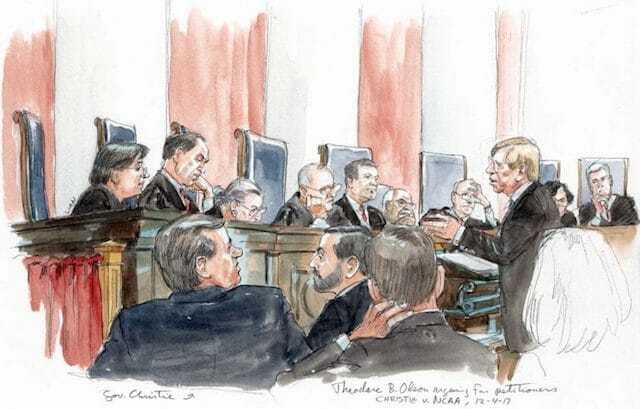 The quirky nature of the Supreme Court sports betting case could also present an ambiguous middle ground whereby New Jersey could prevail in a narrow ruling on statutory grounds—finding that New Jersey’s partial repeal of its prohibitions on sports betting is permissible—and having the Supreme Court otherwise uphold PASPA, leaving the question of PASPA’s constitutionality for another day. The PredictIt market is leaning heavily towards “Yes,” suggesting that PASPA’s demise is forthcoming. As of February 5, 4,291 shares have traded hands, with “Yes” priced at 86¢ and “No” priced at 14¢. In other words, New Jersey is the favorite and the sports league quintet are heavy underdogs. 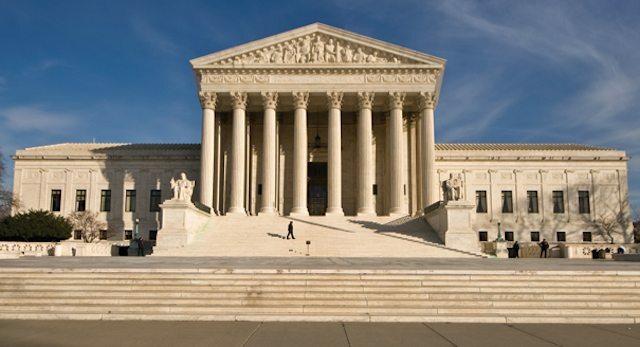 PredictIt’s market for the Supreme Court sports betting case closes on the day the Supreme Court issues its ruling or December 31, 2018, whichever occurs first. 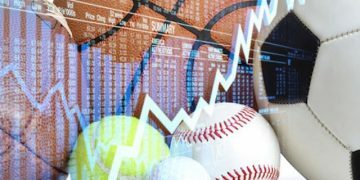 Trading activity in the market devoted to the Supreme Court sports betting case to date indicates that PredictIt customers are an informed bunch. The greatest volume and volatility both occurred on the same day: December 4, 2017. The price for “Yes” shares opened at 58¢ and closed at 83¢. A total of 967 shares traded hands on the day, almost double that of any other single day since the market opened. What happened on December 4, 2017? 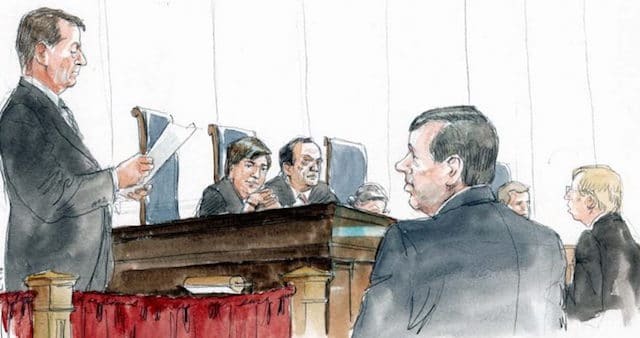 Supreme Court oral argument in the sports betting case started at about 10:00am that day. By 11:15am, word spread from the courtroom that a majority of the justices seemed receptive to New Jersey’s legal arguments. PredictIt traders appeared to have absorbed the news quickly, settling on a price that has been steady since then. That Supreme Court oral argument matters makes sense to PredictIt’s Will Jennings. Experts interviewed by Sports Handle were unaware of any prior cash-based prediction market devoted to Supreme Court outcomes. Such uniqueness is no barrier to predictive accuracy, however. “A market like this is beyond the bounds of all the research studies I have published on prediction markets,” said Snowberg, who was also a co-author of the 2008 Science article. “However, I would note that all others prediction markets I have studied have been shown to work well. March 5 is the next scheduled date for the release of Supreme Court decisions. Ryan Rodenberg works as a professor, researcher, and writer. He’s on Twitter @sportslawprof. Ryan Rodenberg works as a professor, researcher, and writer. Prediction Markets Remain ‘Promising’, But What About Sports?